Announced in China earlier this month, Xiaomi’s 48-megapixel camera-toting Redmi Note 7 is quickly becoming one of the most interesting budget smartphones around. Earlier today, the company took to Twitter to tease the phone’s debut in India. While the highlight of the phone is the 48MP camera, the rest of the specifications aren’t too bad either. Between the Snapdragon 660 processor and 3 or 4GB of RAM, you can expect the phone to perform well; the chipset, in particular, is a big update over the aging Snapdragon 636 in the Redmi Note 6. The phone has been updated with a slightly larger 6.3-inch display with a teardrop notch. On the back, the phone opts for a glossy, gradient style finish that seems to take inspiration from Honor’s phones. As mentioned earlier, the phone has a 48MP camera that, combined with a 5MP depth sensing unit, should offer some interesting use cases. The Xiaomi Redmi Note 7 uses a Samsung GM1 Isocell sensor but the company has suggested that an upcoming Note 7 Pro will have a better Sony IMX586 sensor. We expect Xiaomi to bring the high-spec model to India. While Xiaomi retains a healthy lead in the budget smartphone segment in India, the company recently spun off Redmi into a sub-brand to focus further on increasing their market share. With the upcoming Galaxy M Series from Samsung and competition from upstarts like Realme, the company will need to be particularly aggressive to maintain and grow their lead. If its messaging on Twitter is anything to go by, the company believes its early integration of the 48MP camera (on such a low-cost product) will prove popular. 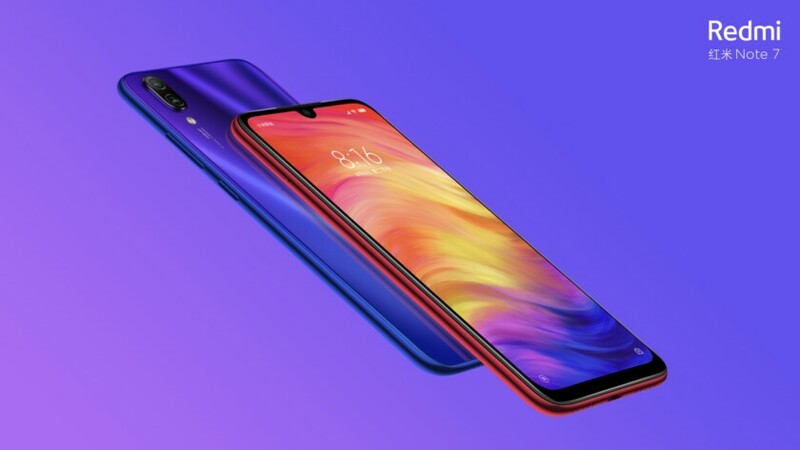 The Redmi Note 7 is priced at 999 yuan (~rupees 10,500) for the base model. Xiaomi tends to bring only the Pro models to India which means you can expect a price point between ~rupees 13,999 and ~rupees 15,999 for the various storage configurations. Do you think Xiaomi still offers the best bang for the buck in the price conscious segment or has the competition caught up? Let us know in the comments.